Shades of Sunshine: Karma Say What? As I said it my insides knew something wasn’t right, although culturally acceptable, so many people use the word, believers and non-alike it didn’t taste right coming out of my mouth … “well you know karma” is what I said, while having a conversation with someone on checking if something was accurately mine or not … which lead me to ask, does the word karma even have a place in a follower of Jesus’ life? So, it originates from the Buddhist and Hindu religions, and it would be hard pressed to go a day without hearing or reading it, right? So in pursuit of knowledge, I worked the Google, and came upon a few other blurbs and blogs on the topic. “The Bible does not teach karma. It teaches grace. 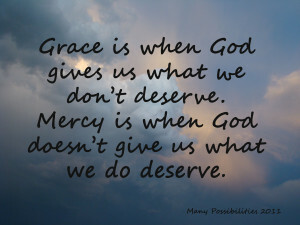 Grace is where you get what you don't deserve. to have it. As you can see, very different to karma. In 2 Corinthians 5:10 we can read that is says, “For we must all appear before the judgment seat of Christ, so that each one may receive what is due for what he has done in the body, whether good or evil.” Being told even prior to that in Romans 6:23, "For the wages of sin is death; but the gift of God is eternal life through Jesus Christ our Lord." These all point to what we, as Christians, believers of the One true God, and His Son (our Savior), should focus on .. the bigger picture (the reason we are here), advancing God’s kingdom, as there are only one of two possible outcomes for everyone once this life has concluded. The price of our sins have been paid, yes we may stumble and fall, but glory be, Jesus’s death and resurrection has set us free! So as believers of Jesus, we do not have to live by the fear or trappings of the idea of karma. The Bible is clear that good and bad falls on the just and unjust, but the way to secure your forever is to accept and declare the truth that Jesus IS savior, as by Him alone are we reconciled to the Father. No amount of good deeds or “right” behavior can earn our way to a blissful eternity. “It is a free gift, so that no man can boast.” While we should try (and try again) to do that which is right, and operate out of love, we do not have to live with the fear that karma lends notion to. Rejoice, I say, rejoice. Give thanks to the Creator for His wonderful plan, for Jesus’ obedience to the Father, and for the Spirit that guides! For further reading check out “Reaping What You Sow: Christian Karma” on Crosswalk.com by Whitney Hopler.